Originally composed of a trio of Ying bothers and one Ying sister, the eponymous quartet began playing together after graduating from Eastman School of Music about 22 years ago. The most recent arrival, first violinist Robin Scott added flair, excitement, and buttery elegance to the group’s solid yet highly-nuanced presence. While others were celebrating an Easter Vigil, those of us in Jordan Hall on Saturday night were also in the presence of the sublime in two meaty Beethoven quartets. 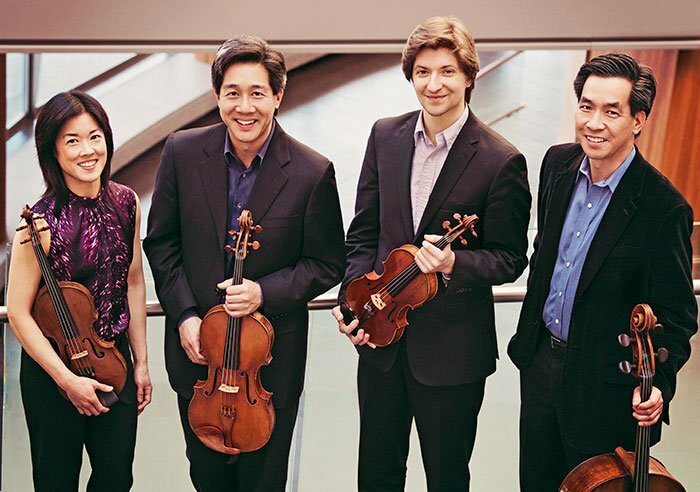 The Ying Quartet delivered the master’s No. 12 in E-flat major, Op. 127, the first of the last five Beethoven quartets, with great intensity and high-spirited energy, hallmarks of much of the evening’s faster movements. From the very beginning, I was extremely impressed with the first violinist Robin Scott, who seems a perfect fit for this ensemble. Cellist David Ying played with passion, intelligence and sensitivity throughout the evening, as did violinist Janet Ying’s with her exquisite, warm, honeyed sound. Violist Phillip Ying didn’t shout at us, but was perfectly matched in intensity and joy of music-making with the rest of the strings. Continuing on into Op. 59 No. 1, the solidity of common impulse along with the deep polish of the sound and absence of any rough edges recalled the Tokyo in its Peter Oundjian period. Maturity and gratifying generosity characterized these interpretations. Many of us fondly remember the foursome’s 2001-2008 stint as Blodgett Artists-in-Residence at Harvard University. Now serving as quartet-in-residence at Eastman School of Music and ensemble-in-residence at Bowdoin Music Festival, the Yings have enjoyed quite an unusual history. One of the first ensembles to be awarded a National Endowment for the Arts grant in 1992 to live and perform in a rural area, the Yings got their sea legs playing in social club, churches, banks, workplaces, and schools, making music an integral part of the life of Jessup, a small town in northeast Iowa one-hour south of Spillville, where Dvořák famously resided and composed. They have founded ”No Boundaries” at Symphony Space in New York City that seeks to “re-imagine the concert experience.” Their bio explains: “Collaborations with actors, dancers, electronics, a host of non-classical musicians, a magician and even a Chinese noodle chef gave new and thoughtful context to a wide variety of both traditional and contemporary string quartet music.” They have also worked with composer Tod Machover and the MIT Media lab in the use of Hyperscore, an innovative musical composition software. The Ying’s ongoing LifeMusic commissioning project, created in response to their commitment to expanding the rich string quartet repertoire, has already achieved impressive successes. Supported by the Institute for American Music, the Yings commission both established and emerging composers to create music that reflects contemporary American life. Their most recent recording of commissions, titled “The United States,” features works by Ned Rorem, Jennifer Higdon, Chen Yi, and Augusta Read Thomas. Other recent works include Lowell Liebermann’s String Quartet No. 3, To the Victims of War”; Sebastian Currier’s Next Atlantis; Richard Danielpour’s Quartet No. 6, Addio; and John Novacek’s Three Rags for String Quartet. The 2011- 12 season featured Billy Childs’ Awakening,” 2012-13 brought the debut of Kenji Bunch’s Quartet No. 2, “Concussion Theory,” and 2013-14 will premiere a work by the celebrated Lera Auerbach. A big thank-you to Catherine Tan Chan for the Foundation for Chinese Perfroming Arts. Their 117 concerts, beginning in 1989, have become bright fixtures of the Boston musical landscape. On Sat. May 15th in Jordan Hall, pianist Haochen Zhang will play works of Chopin, Schubert, and Prokofiev.